Hophitnews.ru is a rather interesting adware server that also doubles as a search engine. It was created with the intention of subjecting you to rather shady-looking advertisements that generate revenue when clicked. It might redirect you to its subpage at Hophitnews.ru/energysm that features many links that can be malicious in nature. Removing it is highly recommended because some of the promoted links can be of malicious nature. Our research suggests that some of them can be scam websites that may want to extract personal information from you while others might get your PC infected with malware. In short, this adware server is bad news, but if you want to find out more, please read this whole article. One look at Hophitnews.ru makes it clear that it was created by Russia-based developers for the Russian market because everything on this adware server is in the Russian language. Our research has shown that this adware server can show you ads only if your PC has been infected with adware. At present, we do not know the particular programs that show this server’s ads, but we have received unconfirmed reports that the adware is distributed through malicious software downloaders featured on unreliable Russian free software hosting sites. The downloaders are there to install additional software secretly, so you should be wary of websites that require you to download an application to download the software you originally wanted. We have found that Hophitnews.ru is similar to Hrforlastnews.ru/news, bhnr1.ru/news, and gdslkeee1ru.ru/news. All of them come from the same developer, so we are positive that this developer has created all of these servers to generate advertising revenue. 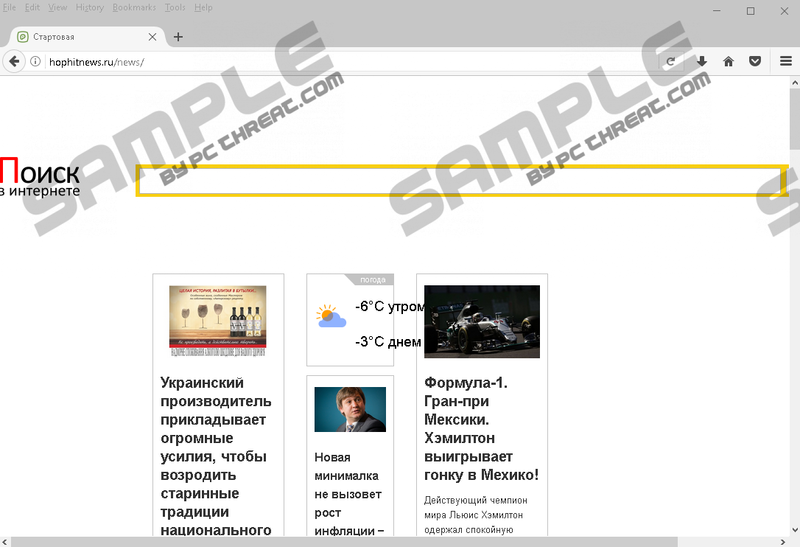 Depending on the browser extension, your PC can get affected by Hophitnews.ru if you use Google Chrome, Mozilla Firefox or Microsoft Internet Explorer. However, we have found some particular details about this server that suggest that it works differently with Chrome. It automatically opens Chrome every 33 minutes because it creates a scheduled task in %WINDIR%\System32\Tasks. It contains a file named "hophitnews.ru/energysm" which redirects to Hophitnews.ru/energysm. Hence, the malware that features this adware server will constantly nag you with random browser launches and unasked-for advertisements. This subpage redirects to another promoted website each time you visit it. It promotes games, credit loans, surveys, and other shady content. Hophitnews.ru features a search engine that redirects all search queries to Google.ua. However, it does not show modified search results with ads, so the search results should be safe. Nevertheless, the promoted websites featured on Hophitnews.ru’s main page are a cause for concern because some of them can be of malicious nature and redirect you to gambling, malware hosting, or scam sites. The things lurking for you when you use Hophitnews.ru should not be ignored. Therefore, we recommend that you remove it from your PC as soon as the opportunity arises. So there you have it, that is all of the information about Hophitnews.ru that is currently available. Evidently, it is an adware server, and for this reason, you should not expect it to deliver you safe and reliable content. After taking a look at it, we suggest that you remove it because it can jeopardize your computer’s security. Please consult the instructions provided below this article. Right-click the Start screen/button and select Control Panel. Find unwanted program and click Uninstall. Find the software and click Uninstall. Locate the malicious extension and click Remove. Enter %WINDIR%\System32\Tasks in the address box and hit Enter. Quick & tested solution for Hophitnews.ru removal.